Holy cow, this was sooooo good. As I started cooking it, I was actually a little worried that the dish would be a bit too rich and pungent, even for a lamb lover like me. I was really glad I'd used two small lamb shanks and 4 lamb loins on the bones for this dish. I will make a note never to use smaller cuts of meat forthis dish as even the lamb loins broke into tiny morsels with the long cooking time. First off, I must thank Oslo Foodie for posting this recipe on her blog. It is absolutely delish, even if it takes about two days to cook. But if you use a slow cooker like me, this works out well. I bought the lamb last night and placed everything in the crock pot to cook overnight. This morning, when I stumbled off to work, I switched it off and just draped a tea towel over it to retain as much of the heat as possible. Even though I only got back at 9.15pm tonight, the dish held well. I heated it up slowly and started making the mash potatoes to go with it. 30 minutes later, I was stuffing my face and singing Lambchops a la Sherry Lewis. J, if you are reading this, I blame you. Here's Oslo Foodie's recipe which I stayed fairly true to - a rare occurence for me. 2 tsp of black peppercorns - OK, I lie. I must have added like 3 or maybe even four. Hey, I'm Eurasian, gimme a break! I must say, I was feeling rather poorly the last few weeks trying to kick this gastrointestinal flu. Everything I've eaten has not fully agreed with me as well as this dish. Talk about comfort dish. It made me think of warm, woolly blankie; soft, sun-warmed cotton on cheeks; warm spring water trickling along your limbs ... everything comforting and warm. I felt so much better after eating it, I was thinking of bottling the whole thing as a cure-all. Better still, I paired it with mashed potatoes - only my favouritest comfort food in the whole wide world. A friend used to kid me that I must have part Irish in me because of my love of potatoes. I would cheekily retort that I have only ever had one Irish boyfriend ... I know ... TMI. Eeeuuuwww, sorry. 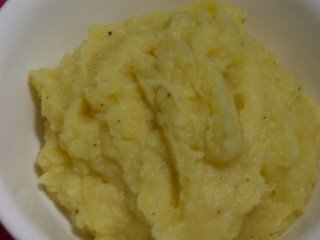 Mash potatoes are so easy to make, I can never understand why peeps would buy those instant stuff. The fresh made ones are so phenomenal that it truly baffles me. I was so happy after this meal, I was skipping along ... well, as well as I could considering I was bloody full after pigging out. The creamy, luscious mash potatoes melting right alongside the melt-in-the-mouth lamb and sensually soft cabbage is ambrosia enough to make you weak in the knees. Except this dish is so hearty that you might be able to lift Norwegian woods after this. On the taste scale, this is near perfect. I give it a 9.25/10. 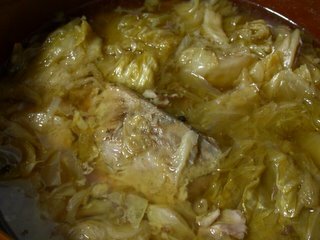 Healthwise, normally lamb would not score that highly being a fairly fatty meat, but the boudacious amount of cabbage makes it a healthy dish. Also, do not forget there is no oil added at all in this dish. 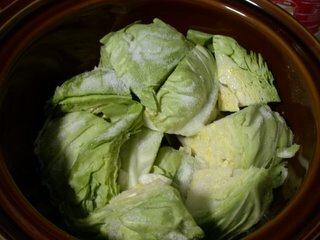 Just so you know, cabbage is an incredible vegetable. 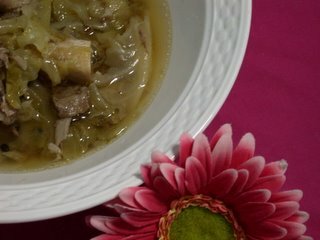 It not only helps you lose weight, which is why it features so prominently in the infamous Soup Diet or "American Heart Association Diet" (or so I've heard - sic) but it is also good for settling a nervous stomach. Mine has been so nervous it's been seeing a therapist so this dish was a God sent. Therefore I give it a respectable 7.75/10. I was holding my breath for you, MM but now I am so glad you like it :). This is typical of Norwegian traditional food, simple yet delicious. Some would call it bland but I disagree. Over here we really do have quite good produce (lamb in this case)and even when there are only few ingredients, if the produce is high quality and cooked well, the results would be good honest food. Enjoy the rest of your fårikål (pronounced four-ri-kohl). Ah ... I knew I was pronouncing it wrong. It sounded almost Afrikaan the way I was saying it. LOL. I did not think it was bland at all but then again I added almost 4 tsp of peppercorn. You know it is weird, I've been to Norway - hell I worked for a Norwegian company - but the only thing I ate that was Norwegian was some raw or was it just very pickled (?) herring thing at some the National Orchestral or Symphony thing at the Embassy and a whale thingy at the rig once. Otherwise, all my Norwegian colleagues loved Asian food and ice cream (boy, did they love ice cream - grown men eating ice cream twice a day at least) so we were forever eating those! Again, ta so much for your recipe. By the way I still have not found the brie blu cheese. Peeps have been giving me the "You on drugs, woman?" looks at the delis & supermarkets. four ri kohl.....love this.. from OF page over to you. but have not cooked this myself. Popped by from OsloFoodie. Nice blog, interesting food. Likewise I followed Fats through Oslo's door. Nice post. You've certainly tempted me. I'm not gonna try to pronounce it, but I will try to cook it. Now where can I find a lamb in Saigon??? Tried the recipe finally and it worked first time round but I added extra ingredients - some coarsely chopped carrots ( I am a carrot fan) and a pinch of cardamon (don't know why leh but I just picked up at the super on the way home cos I had a funny feeling that it would go) and yes, I used more than 4 tsp of peppercorns. Sorry ah...but you know Peranakans must have their food at least a tad spicy one. 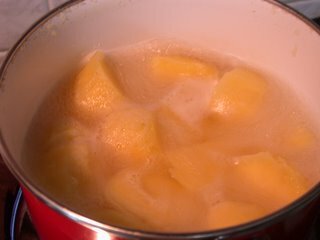 Forgot to mention that I ditch the idea of doing up mashed potatoes cos I wanted to watch the last episode of CSI (the fab episode written by Quentin T) in favour of ready-made butter-n-herbed potatoes from the super (just have to pop it into the microwave and walla...). They went well together. Hi all, wow .. lots of comments. Kewl! Sha - I looked at your website & I really liked it. Made me miss Europe though. Fatman Seoul - I looked at yours too. There has been a recent Korean movie called Jewel in the Palace shown here & I admit with much embarrassment that I got addicted to it. I really looked forward to the food but can't seem to find the recipes anywhere. Sigh! Pieman - Do they have mutton? Maybe that can be a substitute? Love Vietnamese food too. Especially pho and the "Saigon pancake" from my fave local Vietnamese restaurant. 3A - that sounds like stew in the end! I have a great stew recipe which I will send you one day.